IBS affects millions of Americans’ quality of life. Fortunately, dietitians have a unique opportunity to help people manage the disabling symptoms associated with this disorder. Abdominal pain, bloating, discomfort, constipation, and diarrhea. Welcome to the world of irritable bowel syndrome (IBS), a disorder that deeply affects both the quality of life and productivity of millions of people. Chances are you’ve crossed paths with IBS, as it’s the most frequently diagnosed digestive disorder in the United States, affecting an estimated 7% to 10% of Americans. IBS is more common in women, lower socioeconomic groups, and patients younger than the age of 50. The IBS patient population is as long suffering as it is large, with this group making more visits to physicians, undergoing more diagnostic tests, being prescribed more medications, missing more workdays, having lower work productivity, being hospitalized more frequently, and accounting for greater overall direct costs than patients without IBS. The International Foundation for Functional Gastrointestinal Disorders recently commissioned a nationwide survey of patients with IBS to determine the prevalence and severity of the symptoms they experience and found that patients often live many years with the condition before receiving an accurate diagnosis. Patients also reported using nearly 300 different types of prescription and over-the-counter medications in attempts to find relief. Nearly 45% of study participants noted severe symptoms and another 40% reported moderate pain. Patients described IBS symptoms as seriously impacting their daily lives; 71% reported two or more episodes of IBS per week; and nearly one half reported daily events. “IBS is the No. 1 cause of absenteeism in the workforce. It’s a big deal to not be able to go to work. People are so afraid of having an accident,” says Leslie Bonci, MPH, RD, author of the American Dietetic Association Guide to Better Digestion. To best help their patients with IBS find relief and enjoy a healthy, balanced diet, dietitians should develop a good understanding of IBS, current treatment guidelines, and the role that diet therapy can play in managing the condition. Understanding of IBS has changed drastically in recent years, although some may argue that it hasn’t changed enough. In the past, IBS was a “wastebasket” diagnosis given to patients with unexplainable gastrointestinal (GI) symptoms. Without a biological marker to confirm IBS, diagnosing the disorder has been challenging. But considerable efforts have been made to better diagnose IBS and pinpoint the constellation of specific GI symptoms that mark its path. IBS is part of a group of disorders classified as functional GI disorders, which include IBS, functional bloating, functional constipation, functional diarrhea, and unspecified functional bowel disorder, according to the Rome III criteria. IBS is characterized by abdominal discomfort associated with altered bowel function without the presence of structural or biochemical abnormalities. The Rome III criteria specify that a diagnosis of IBS can be made with at least three months (with onset at least six months previously) of recurrent abdominal pain or discomfort associated with two or more of the following conditions: improvement with defecation, onset associated with a change in frequency of stool, and onset associated with a change in form of stool. Many factors appear to lurk behind IBS, such as genetic predisposition, environment, allergy, infection and inflammation, bacterial overgrowth, hormones, and neurotransmitter disorders. Conditions often associated with IBS are anxiety, panic, and mood and somatization disorders. Gastroenterologists are encouraged to rule out other diseases that may cause similar symptoms, including bowel obstruction, malignancy, inflammatory bowel disease, and celiac disease. “You cannot say that there is one answer for IBS. The problem with IBS is that it really has multifactorial contributors to digestive tract problems, such as diarrhea, constipation, bloating, and abdominal pain focused in the lower bowel, that can be due to many causes. Stress can be an enormous contributor. Celiac disease, which is underdiagnosed, could be the cause in a lot of cases. It is still a diagnosis of exclusion,” says Janice Vickerstaff Joneja, PhD, RD, a researcher, an educator, and an author in the field of food allergy and intolerance in Kamloops, British Columbia, Canada. Her book Digestion, Diet and Disease: Irritable Bowel Syndrome and Gastrointestinal Function is a good resource for the nutritional management of IBS. Historically, managing IBS has been just about as confusing as diagnosing it. Treatment has focused on minimizing symptoms by relying on a combination of medications, bulking agents, psychological therapies, and dietary interventions. Yet, there is a lack of consensus and solid evidence backing some IBS treatments. Patsy Catsos, MS, RD, LD, a private practice dietitian and the author of IBS — Free at Last! The Revolutionary, New Step-by-Step Method for Those Who Have Tried Everything. Control IBS Symptoms by Limiting FODMAPS Carbohydrates in Your Diet, believes that IBS has a multitude of potential triggers, including lifestyle issues such as stress and exercise, food chemicals such as caffeine, food intolerances, and immune-mediated food sensitivities. “There is bound to be a lack of consensus about treatment if practitioners aren’t willing to open their minds beyond their particular specialty,” says Catsos. Based on the latest scientific findings, the American College of Gastroenterology (ACG) published a new set of guidelines for managing IBS in the January issue of The American Journal of Gastroenterology. The guidelines suggest that fiber products, probiotics, nonabsorbable antibiotics that target the gut, tricyclic and selective serotonin antidepressants, selective C-2 chloride channel activators, and 5HT3 antagonists may benefit some patients with IBS. Alleviating the symptoms of IBS through diet presents its own challenges. For starters, not enough is known about the effectiveness of diet therapy. In its recent IBS management guidelines, the ACG reported that although patients often believe certain foods exacerbate their IBS symptoms, there is insufficient evidence that food allergy testing or exclusion diets are efficacious in IBS, and their routine use outside a clinical trial is not recommended. “You have to understand that gastroenterologists frequently overlook the idea that food plays a role in IBS. They are focusing on the fact that IBS is a disorder of the digestive tract. We know more or less that food doesn’t cause IBS, but food can make it considerably worse or a good deal better to live with,” says Joneja. Evidence-based guidelines for IBS nutrition therapy have not come as far as many dietitians would like. “The science is limited as far as what we should be doing to help IBS patients with their diet. It is not as well described as that of something like lowering cholesterol,” says Jeannie Gazzaniga-Moloo, PhD, RD, a nutrition counselor, a speaker, a writer, and a spokesperson for the American Dietetic Association (ADA). She recommends the ADA’s Nutrition Care Manual as a good resource for understanding IBS diet therapy. “Functional bowel disorders are often swept under the rug. Patients have different outcome measures with IBS that are often subjective. Dietetic practitioners often do not have expertise with IBS unless they are working in a digestive center, and that is not very common. Dealing with IBS patients can be overwhelming. There is so much vague information out there, it can be frustrating,” says Bonci. A small crop of nutrition experts specializing in digestive disorders have become a critical avenue of support for patients with IBS. “They are pretty frustrated by the time they come to me. They have often done a self-elimination of foods. We can help them relieve the stress and pressure of what they are doing every day. We can empower them by helping manage their symptoms. It’s really important to get a dietitian involved with GI conditions, so that people are not being overly restricted in their diet,” says Gazzaniga-Moloo. In fact, the ADA recommends that patients with IBS see an RD for a minimum of three visits for nutrition therapy after diagnosis. Dietitians working with patients who have IBS often report frustration that gastroenterologists are not referring patients to dietitians frequently enough. “Dietitians need to do a better job letting gastroenterologists know who we are. It’s not on the tip of their tongues to refer patients to a dietitian, especially with digestive disorders, but we are a critical part of the team. There’s also the issue of who is going to pay for the dietitian’s service, although many people are so anxious to receive help, they are willing to pay cash. People are so desperate; they have tried all sorts of stuff out there. They need assurance. You can give them information that they can use,” says Bonci. IBS nutrition experts stress that a good starting place is taking a detailed diet and symptom history to evaluate individual food intolerances and responses. Joneja believes that after the physician has ruled out other conditions such as celiac disease and lactose intolerance, the patient should complete a food and symptom record for seven days, listing the severity of his or her symptoms. The dietitian can analyze this for imbalances. In the American Dietetic Association Guide to Better Digestion, Bonci offers an example of a food and symptom diary that includes columns for time, food/supplement, amount, activities, and symptoms during the day, which patients can use to track detailed information about foods and activities that give them trouble. The ADA’s Nutrition Care Manual suggests that patients with IBS receive a complete nutritional assessment that includes a food history, anthropometrics, and biochemical and clinical parameters. Dietitians should identify issues such as swallowing problems, nausea, vomiting, constipation, diarrhea, heartburn, food allergies and intolerances, cultural food practices, and alternative therapies in the assessment. The single most important rule about IBS nutrition therapy may be that there is no one “IBS diet.” “In treating IBS, remember that one man’s meat is another man’s poison. For example, some people use prunes as part of a healthy diet to ‘stay regular.’ Prunes are famous for their laxative effect, probably because they contain generous amounts of naturally occurring sugar alcohols. Certain clients with IBS, on the other hand, may find sugar alcohols far from helpful, causing painful IBS symptoms when consumed,” says Catsos. Dietitians may benefit from keeping in mind that IBS is a multifactorial disorder that has a strong connection with stress and emotions. “It’s a vicious cycle. People stay away from foods because it’s the one thing they can control. But then their symptoms might get worse just because they are; there’s nothing people can do about it. Tell patients to relax while they’re eating and not to eat too much at one time. They need reassurance,” suggests Bonci. Catsos recommends stress management techniques such as exercise, therapy, or yoga. While the ACG does not currently support the use of elimination diets for treating patients with IBS, plenty of nutrition experts find them invaluable. In her book, Bonci outlines potentially bothersome foods for patients with IBS, including fried foods, dried beans, caffeine, carbonated beverages, alcohol, cabbage family foods, sugar alcohols, fructose, and lactose. She recommends that patients observe how many of these foods they eat regularly and whether cutting back on them reduces symptoms. Yet, she cautions that elimination diets have not been proven effective and may add even more stress to the situation. Joneja takes advantage of a specific exclusion diet for four weeks when treating clients with IBS. Foods that are excluded in the initial elimination phase are those that research has identified as potential contributors to symptoms in an already disordered digestive tract. “As the symptoms improve, I reintroduce foods one at a time to determine their effect. If the food is tolerated, it is included in the diet,” says Joneja. In her book, Catsos explores the role that intolerance to certain dietary carbohydrates known as FODMAPS (fermentable oligosaccharides, disaccharides, and monosaccharides and polyols) play in IBS symptoms. “FODMAPS carbohydrates, including lactose, fructose, sugar alcohols, fructans, and galactans, cause IBS symptoms because they are both fermentable and osmotically active. During the elimination phase, the patient consumes only foods that contain little or no FODMAPS carbohydrates. Next, the patient challenges herself in a systematic way with each type of carbohydrate and observes symptoms. 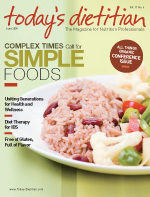 Few, if any, foods must be eliminated from the diet permanently, as many tips and techniques are available to manage symptoms caused by each class of carbohydrates,” says Catsos, who lists her Web site (www.ibsfree.net) as a helpful resource for both patients and dietitians. “A patient-targeted elimination diet with 20 to 25 safe foods is essential for the first 10 days of therapy to bring a patient into remission,” says Hogan, who uses lab-assisted elimination as a tool for treating IBS. “Once the patient is feeling much, much better—typically 55% improvement in global symptoms with remission of diarrhea—it’s easy to test new foods serially to check each one for tolerance. With this strategy, the patient is able to systematically make their diet more and more normal while not losing track of the cause and effect of delayed reaction.” Hogan reports a boom in the field for dietitians using LEAP (lifestyle, eating, and performance) testing. Fiber seems to be one of the most controversial subjects for those with IBS. The ADA’s Nutrition Care Manual suggests that patients with IBS slowly increase their fiber intake to 25 to 35 g/day as tolerated and increase their fluid intake accordingly. But experts stress that fiber therapy may have an individualized response that shouldn’t be underestimated. Joneja explains that since humans don’t possess the enzymes to break down fiber, it is not digestible or absorbed in the colon and becomes a “nice substrate for fermentation.” The two types of fiber, soluble and insoluble, may have different effects on people. The soluble fiber, which forms a gel, seems more advantageous than insoluble fiber, which sits in the colon and builds up, creating a good substrate for gas and bloating. “For many IBS sufferers, insoluble fiber can make symptoms worse,” adds Joneja. Research is beginning to support a potential role for probiotics in IBS, with variability depending on the use of different probiotic strains, their ability to adhere to and colonize in the GI tract, and the number of colony-forming units an individual ingests. Several studies highlighting the safety and efficacy of probiotics in improving symptoms and normalizing bowel movement frequency for patients experiencing constipation or diarrhea related to IBS were presented at the ACG’s annual scientific meeting in October 2008. According to a 2008 article on prebiotics and probiotics in dietetic practice published in the Journal of the American Dietetic Association, Bifidobacterium infantis 35264 in particular has been shown in published human studies to be effective in treating IBS. Catsos recommends a probiotic based on bifidum bacteria, such as B infantis 35264, because bifidobacterium is the only group of common gut bacteria that does not produce any gases. Many IBS nutrition experts find prebiotics and probiotics to be helpful for their clients but stress that they should not be used as a first-line defense. Instead, it’s important to get to the root of food sensitivities that may trigger symptoms. “Probiotics are microorganisms that can help the symptoms of IBS by regulating motility, constipation, and diarrhea, but it isn’t improving the overall syndrome,” says Joneja. Perhaps the most difficult task dietitians face is helping patients with IBS find their way to healthy, balanced eating. After years of self-elimination, frustration, and debilitating symptoms, this may be easier said than done. “My goal is to normalize their eating pattern. If they are not eating certain food groups, they may not be getting adequate nutrients,” says Gazzaniga-Moloo. “It’s really important to keep in mind that many people may be overly restrictive.” By gradually and successfully adding foods back into the diet, one can come closer to a healthful, stress-free eating pattern. In the end, dietitians working with patients with IBS report feeling invigorated by their work. With so much to learn and so much on the line for their patients, there’s not a moment of boredom. “This is a movement that has inspired the best in our profession to do even better,” says Hogan. She believes that this field of nutritional care produces such positive benefits for the patient in a short span of time (10 days), leaving both the dietitian and the patient feeling great. Hogan hints that at this year’s ADA Food & Nutrition Conference & Expo, you can expect to find sessions on IBS dietary testing and management with a little culinary flair. “IBS nutrition management is absolutely in its infancy. There are a few pioneers helping to create expertise in this area, and they’re learning as they go. People with IBS aren’t feeling good. We need to help them spend time in their kitchens and feel better again,” says Bonci.